Happy New Year! Get Kindle Craft books at a great price today! $2.99 e-book deal at Amazon. 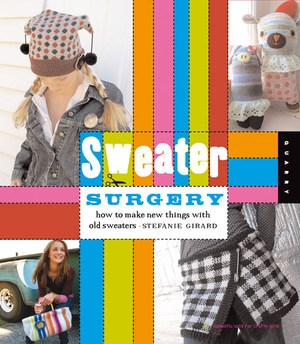 So if you've ever wanted a copy of Sweater Surgery: How to Make New Things With Old Sweaters, or any of the following books on your Kindle, you can get them at the amazing price of $2.99 today only. Oh, and if you want to give them as a gift, you can do that too! Check out Amazon for Kindle $2.99 deals on lots more Quayside Publishing Group books through January 10th, 2013! I know Halloween is this weekend, but when I got Eileen Hull's new Flowers 3-D #2 die and saw the part that makes a section of what looks like fringe to me, I thought of Christmas trees! And since Sizzix dies cut recycled wool felted sweaters like a dream, and being the author of Sweater Surgery: How to Make New Things with Old Sweaters, you know what's coming...these cute as can be recycled wool felted sweater Christmas trees! I started by cutting scraps of the recycled wool felted sweaters and getting all different shades of fringe sections. I had some cardboard cones already made in prep for this holiday season of Christmas tree making as I always make a few new ones each year. These cones were a bit too big and I knew I wanted to make 3 trees (as 3 is the minimum for a collection). So off to the recycle bin, and I happened to have a cereal box, and a folder of some promotional material came in so I just rolled them into 3 cones of varying sizes. I recommend the color of your cardboard cone be similar to the shades of your fringe so if some peeks through it will blend. I decided each tree would be a bit of a different collection of shades of sweaters, light, medium and dark. I started at the bottom and hot glued each row of the die cut fringe. All that was left to do was whip up a few pom poms to top them off. I did this using two different yarns and just wrapped around my fingers a bunch of times. Then I tied the loops around the center and cut the loops open. If you want to see what else this fabulous die cut will make, use the Sizzix button on the top right side column to hop to a whole bunch more blogs to see what my fellow designers have created with Flowers 3-D #2 die cut. Want to WIN a Flowers 3-D #2 Die? 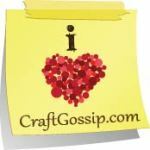 Pop on over to the blog Oh My Crafts and enter! Contemporary crafters are thriving on personalizing, modifying, and altering fashion, and as a way to take a greener approach to their creative lifestyle. This book shows you how to upcycle all your slightly worn, slightly damaged, or out-of-style sweaters into fabulous new items for your wardrobe and your home. Readers learn how to choose, cut, restitch, felt, and embellish old sweater fabric, transforming it into beautiful handbags, mittens, scarves, hats, hoodies, skirts, jewelry, soft toys, pillows, and more! You'll find complete instructions for 27 projects, plus a huge gallery of exciting ideas for further inspiration. Stefanie Girard (Los Angeles, CA) has a degree in industrial design from Pratt Institute and worked as a set decorator and prop master for 10 years in the entertainment industry. She has produced, written scripts, and edited Web content for television shows and has been covering these creative topics for HGTV, DIY Network, and Lifetime TV. Check out more recycled sweater projects at www.sweatersurgery.blogspot.com.